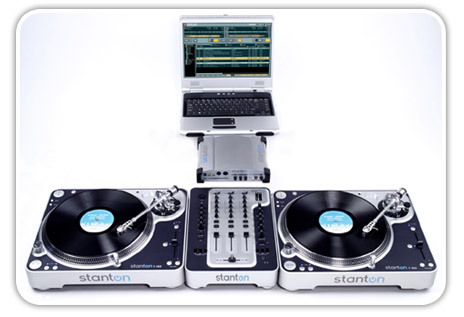 Today I am introducing a new column that will cover the technology and the issues involved with being a mobile DJ in 2005. Although I still believe in (and spin) good, ole-fashioned vinyl records, there’s a trend in the DJ industry to go digital – not unlike the digital revolution that swept through photography over the past few years. One thing this column won’t do is push digital over analog, I’m a big time vinyl geek and frankly don’t want to open that can of worms. There are benefits to both analog and digital and they can co-exist quite nicely. So you’re into music, eh? A good way to start is to pick a couple of genres and start listening to them a lot. Load up your iPod with tracks and shuffle through those bad boys while you’re at the gym, listen to audio streams (using the Radio button iTunes is a quick way to start) and brush up on artists and titles in genres that you like. I would highly recommend you use iTunes’ “My Rating” feature to rate your songs so that the really goods ones bubble up to the top of your smart playlists and the ones are poor, corrupt, or cut out at the end get ranked at the bottom. Also make Smart Playlists for “unrated” songs, that way you can listen to those and rate them too. The next thing you need to do is find yourself a nice mixer. While it’s true that you can spin an entire set from your PowerBook with an application like Native Instruments’ Traktor DJ Studio, I prefer to have two sources and an analog mixer. A two source setup will pay dividends if one of them crashes or otherwise squirrels out on you. All you really need is a two-channel mixer so don’t get too caught up in more than that. I use a Rane TTM56 but lots of great options are available including the Stanton SMX-501, Numark DXM06 and the Kam Scratch Pro 100. Once you’ve got a mixer you can begin practicing with two PowerBooks as your one and twos (nicknames for your channel 1 and channel 2 inputs). You’ll want to use two sources when using a mixer. Two PowerBooks are ideal but you can also substitute an iPod, CD/DVD player or turntable in there as well. If you don’t see yourself investing in a mixer and just want to do everything in software, then pick up a copy of Native Instruments’ Traktor DJ Studio and get started with that and Ableton’s Live ASAP. Next Column: The software side of DJing.